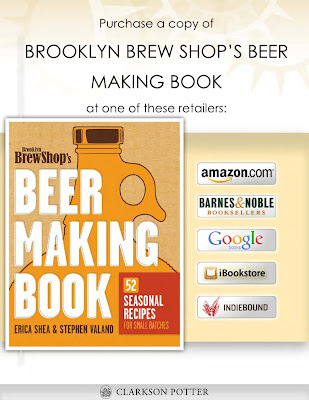 #pdxbeergeeks: Brooklyn Brew Shop: Book Giveaway! Aaaaah! The highly anticipated book from our friends at Brooklyn Brew Shop (Erica Shea & Stephen Valand) is hitting shelves soon - and while this book is definitely one that will get a lot of use, before you head out to place your order, you might want to keep reading. For those in the New York area, the book launch party is November 1st - the rest of us will have to wait just a little while for the books to hit the shelves that day! In the mean time, you have a chance to win a copy of the book (chock a block full of recipes, history & helpful hints) right here! Erica & Stephen know what they're talking about. They bring an unfettered perspective about homebrewing to those just starting out, and for those with more experience, a wealth of new ideas for unusual combinations, as they approach brewing from a more kitchen oriented mindset. With plenty of science and history peppered throughout, the book is enough to keep even the more knowledgeable set intrigued. In addition, their one gallon homebrewing kits would make a perfect addition to this book as a holiday gift set for the fledgling homebrewer in your life. #pdxbeergeeks has a copy of this book to give away! ... to enter to win, visit the Brooklyn Brew Shop site, then tweet us and/or comment here about which of their homebrew kits intrigue you the most! We'll pick one winner at random from the entries, and that winner will receive a copy of the Brooklyn Brew Shop Beer Making Book! You have until Wednesday, October 26th, 2011 at NOON, PST to enter.